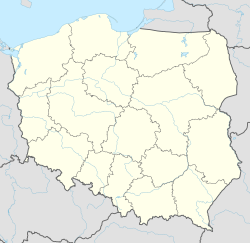 Giżycko [ɡʲiˈʐɨt͡skɔ] (German: Lötzen (help·info), Lithuanian: Lėcius; former Polish: Lec) is a town in northeastern Poland with 29,796 inhabitants (2004). It is situated between Lake Mamry and Lake Niegocin, and has been within the Warmian-Masurian Voivodeship since 1999, having previously been in the Suwałki Voivodeship (1975–1998). It is the seat of Giżycko County. The first known settlements in the area of Giżycko date back Roman times and are connected to Amber Road in vicinity of which Giżycko was located. A defensive grod was known to exist in the area, and in IX was recorded as being ruled by king known as Izegup or Jesegup. In 1008 Bolesław I Chrobry sent an expedition to Christianize the Old Prussians ; according to the legend the missionary Bruno of Querfurt was killed by Sudovians near Lake Niegocin in 1009, and a memorial the Bruno – cross was erected near Gizycko in 1910. The Teutonic Knights built a castle in Prussia named Lötzen (Lec in Polish) in 1340, located at the isthmus between two lakes in Masuria. Lötzen was administered within the Komturei of Balga. The settlement near the castle received town privileges, with a coat of arms and seal, in 1612 while part of the Duchy of Prussia. Lötzen became part of the Kingdom of Prussia in 1701 and was made part of the province of East Prussia in 1773. In 1709/10 the plague claimed 800 victims, only 119 inhabitants survived. In the 19th century, a Lutheran church designed by Karl Friedrich Schinkel was erected in the centre of the town. Lötzen became part of the German Empire in 1871 during the Prussian-led unification of Germany. 1844–1848 the “Feste Boyen“, a fortress named after the Prussian war-minister Hermann von Boyen, was built on a small landtongue between lake Mamry (Mauersee) and lake Niegocin (Löwentinsee). This fortress is one of the largest and best conditioned fortresses of the 19th century. In 1942–1945 it was the headquarters of the German military intelligence service (Fremde Heere Ost) under Reinhard Gehlen. In the 1930s Lötzen was the garrison of several military units of the Wehrmacht as a Sub-area Headquarter of Wehrkreis I, which was headquartered at Königsberg. Staff-, maintenance- and guardtroops of Hitler's headquarter Wolfsschanze and the Oberkommando des Heeres (OKH, army highcommand) were also based in or nearby Lötzen. The OKH was based at the Mauerwald area, ca. 10 km north of Gizycko, an undestroyed bunker system. The town was occupied by the Soviet Union's Red Army in 1945 during World War II and placed under Polish administration after the war ended. The German-speaking populace who had not been evacuated during the war were subsequently expelled westward. The town was renamed Giżycko in 1946 in honor of the Masurian folklorist Gustaw Gizewiusz, a 19th-century Evangelical-Lutheran pastor in southern East Prussia, who had greatly supported Polish language and Polish culture. Giżycko is a popular Summer tourist destination due to its location within the Masurian Lake District. When Poland made the so far only international appearance in bandy, the city was represented. ^ Kossert, Andreas (2006). Masuren. Ostpreußens vergessener Süden (in German). Pantheon. ISBN 3-570-55006-0. Wikimedia Commons has media related to Giżycko. This page was last edited on 6 March 2019, at 07:15 (UTC).